This week our city dealt with a water contamination scare. Everything turned out fine, but we were told not to drink, cook with, or basically use our water at all for 48 hours. Once the "boil advisory" was lifted, our sink was definitely full. I didn't realize we owned this many dishes! Instead of grumbling (as I was tempted to), I turned my eyes upward to the frame on my refrigerator that holds a beautifully timeworn paper, golden with age, graced with my late Grandma Pat's handwriting. I stumbled upon it while my family sifted through my grandparents' belongings after we lost my grandpa last summer. They didn't have much, but sentimental keepsakes like these mean the world to us! 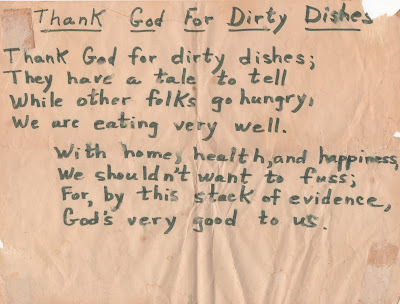 This was a gem I found tucked inside my Grandma Pat's high school Home Economics notebook. I'm so thankful to have it, as it fills my heart with thanksgiving on days when I feel like I can barely keep up with it all. My grandma didn't author this poem, but I adore that it was written in her hand. 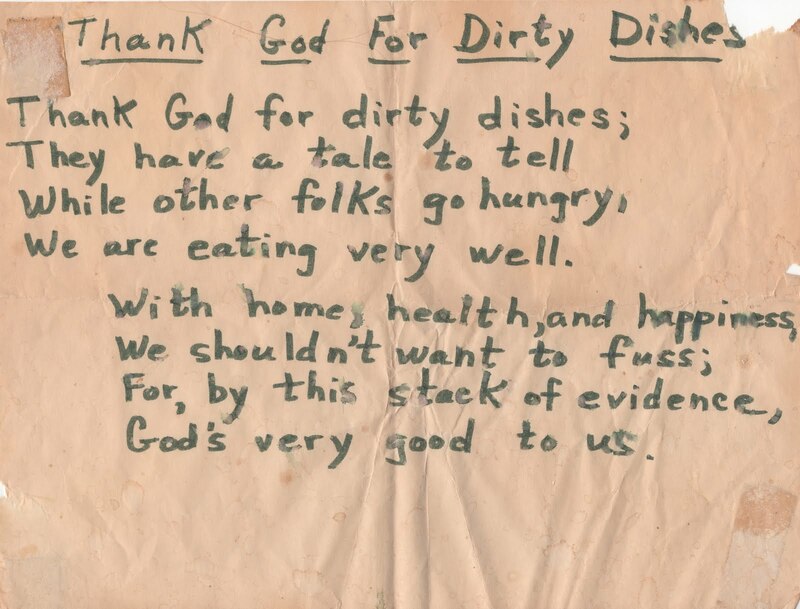 May it remind you, too, to be thankful for dirty dishes!